So over the weekend, our mailman brought not just one, but two big boxes, stuffed to the brim with fabric!! 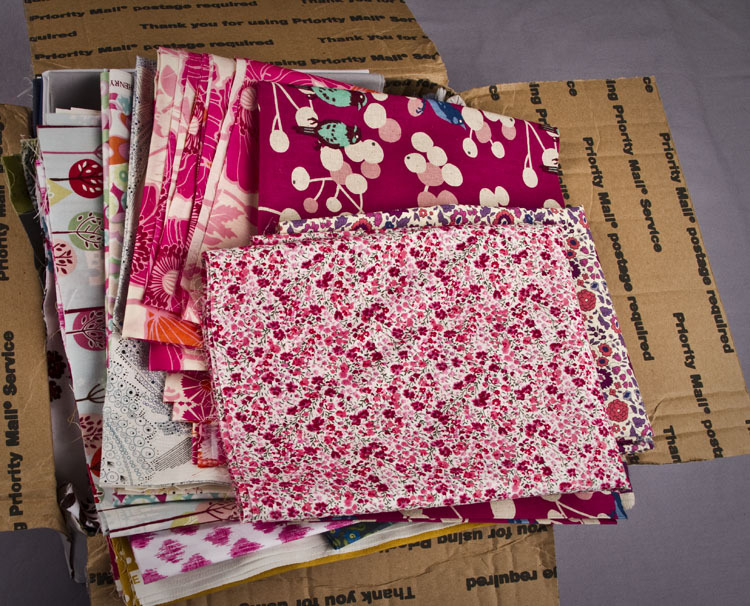 The first box was from In The Beginning, and it held my sample cuts of my new fabric collection. That means that it’s only a few weeks until it hits the stores! All that stuff that I drew, like a million years ago when Bea was a baby, is finally printed on fabric. Yay! 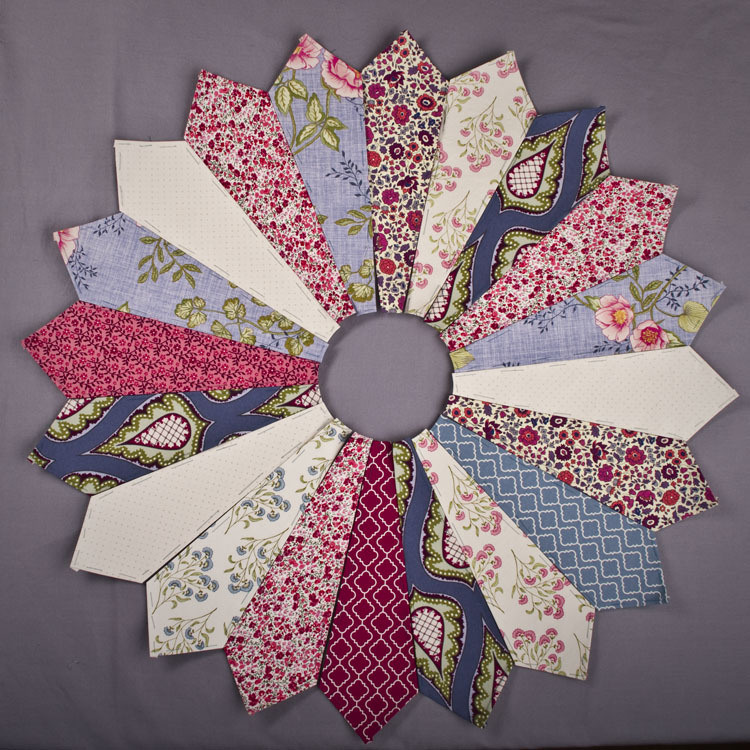 I have to be honest here, I don’t like making quilts with only one collection of fabric, and that includes my own collections. I love the richness that begins to accrue when you use fabrics from different designers, different companies. The colors are going to be slightly different, the style of the prints and the line weights are a little different, and it all adds up to be so much more than just one designer’s variations on a theme. So, in order to make stuff from all the yards of my own fabric that are taking over my sewing space, I needed to buy more fabric. You understand. I hope to share some of the combinations that I’m really excited about over the next few weeks. 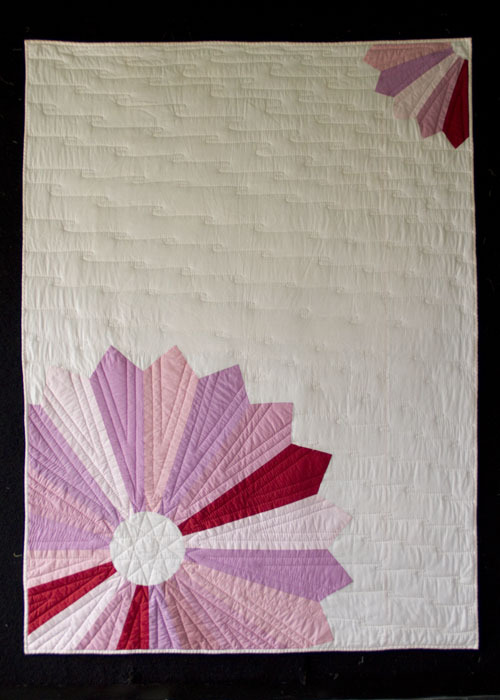 Here’s the first one I am working on- using the Fuchsia and purpley-blues from my collection plus a few precious Liberty Tana Lawns. which I did for Stitch Magazine summer 2012, but I think I’m going to shake up the chrysanthemums in a different way this time. I always wanted to see it done in prints. 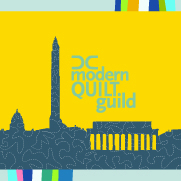 Now you all know what I’ll be working on at Saturday’s DCMQG meeting! In between working on the Austin charity quilt of course. I can multi-task. Can I ever. 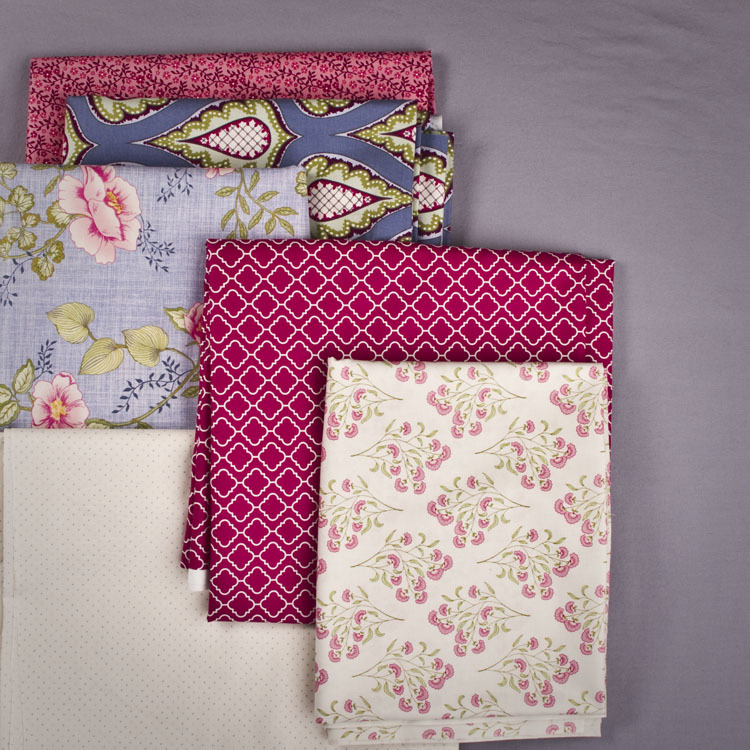 Jesse, your fabrics are beautiful! Can’t wait to see them in the store. I’m assuming In The Beginning will have them. I just live over the mountains in eastern Washington and travel to Seattle quite often. I can see another visit to In The Beginning is on the agenda. Oh, and I love the chrysanthemums done in prints. Of course I love the colors you chose. What a wonderful surprise from the mailman! You must be floating on air:) The flower in prints looks very pretty! What a lovely collection. I was super impressed with your warm autumn color theme for the old dresden plate project you showed at my first DCMQC meeting. Now I am in awe of your very fine talents and taste. 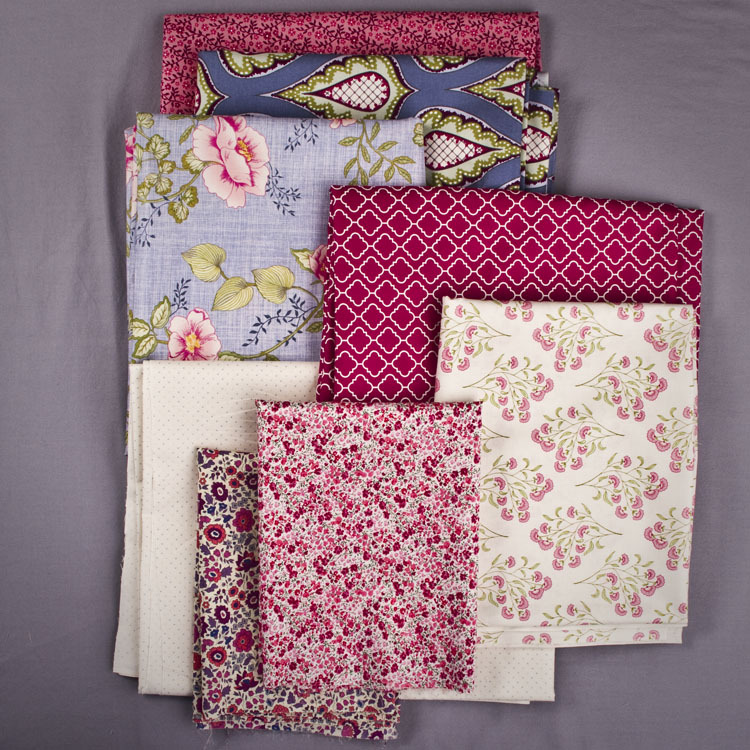 I adore that delicious collection of fabrics you have for your new project. I can’t wait to see them in person! Congratulations. A happy day indeed! I am SO (sew!) excited for you! And the one with the fuchsia background with the geometric on top…that might just be my favorite print ever! I’ll have to bring the piece I bought after Jay McCarroll that has the colors for a quilt I am someday going to make for me…I think I just found the compliment I needed for the stack I’ve got! And as for multi-tasking, woohoo (and thank you). I’m hitting the slight nervousness point of “there’s less than two months to get this done…what was I thinking!”. So excited to see your new line and new acquisitions…hooray for show and tell and sewing days with awesome people! So excited! Your fabrics are beautiful! Congrats! I also really like your giant Dresden! Great seeing you Saturday and your new fabrics. Still thinking about your lovely dresden plates quilt and the way that shot cotton feels. Must get working on mine. Hey, I picked up some of your Autumn Gatherings a few days ago on Hancock’s of Paducah! They haven’t arrived yet but I’m excited to see them in person! Jessie it was the highlight of our day meeting you at Patches. We had already fallen in love with your fabric line and my daughter Jessica was in the process of purchasing some when you and your children arrived. Thanks for creating such a beautiful line for all of us.